I have been asked to start a 2017 thread for our Warmth for Warriors stocking drive. So here I go. For the last several years I have supported the troops each Christmas with a mini stocking drive. The Warmth for Warriors is a non-profit group dedicated to supporting our soldiers both active and retired. Here is the link to their homepage. 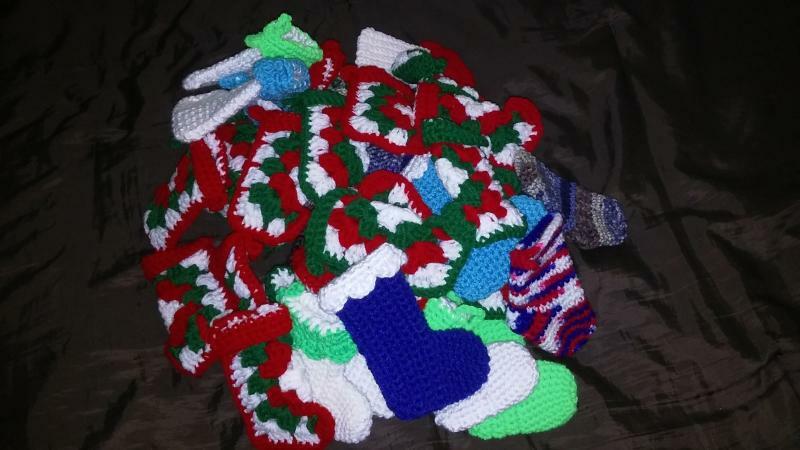 The Warmth for Warriors organization is again calling for crafters to help crochet, knit, or sew mini handmade Christmas stockings for the troops. Stockings should be around 6 inches long and any pattern style or color is accepted. Stockings that are a little smaller or larger are okay too. Last year 1849 miniature stockings filled with soaps, toiletries, and candies were sent overseas to our troops as a little Christmas gifts. The little stockings filled with goodies are a wonderful way to say thank you to our troops and give them a little Christmas cheer during the holidays. Deadline for shipping stockings to Warmth for Warriors and delivery to them is November 1, 2017. 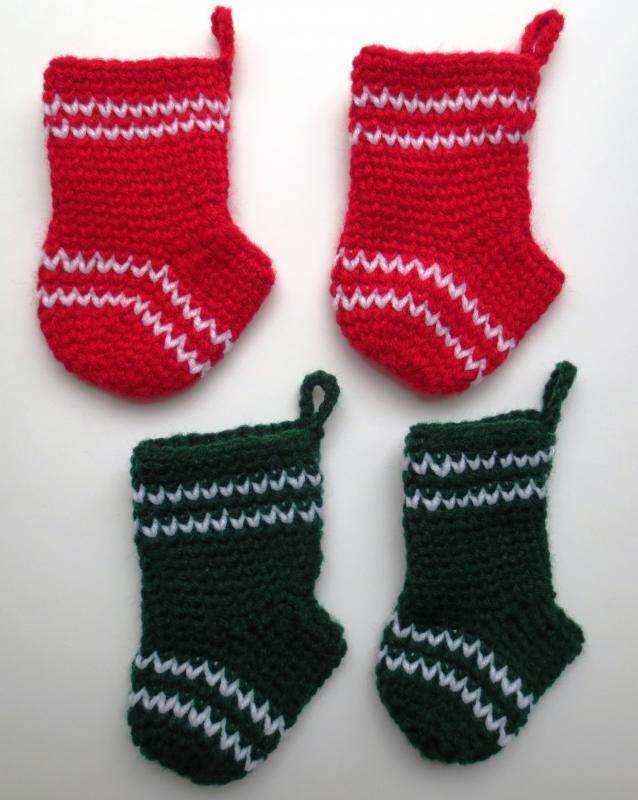 Please join us this year in making mini Christmas stockings. Let's all post and share our ideas and projects while supporting our troops this year. Thank you all in advance for your help. 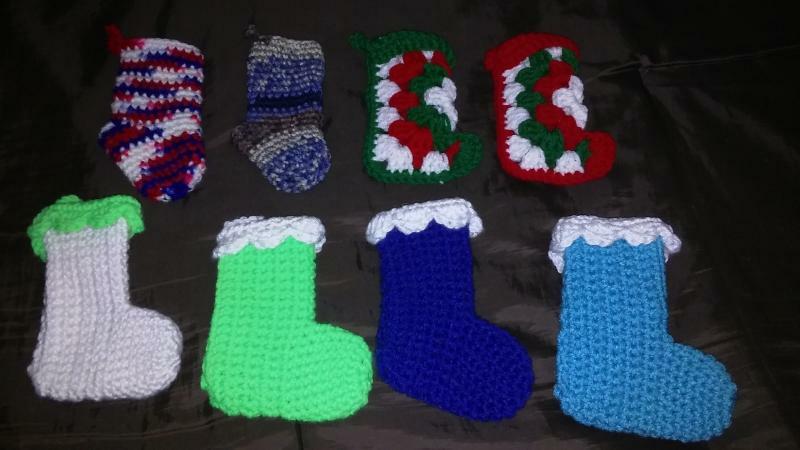 Here are my first four stockings I crocheted this year for the drive. 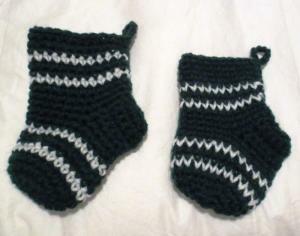 These are crocheted using the waistcoat stitch which is a new stitch I just learned. I hope to write up a pattern and share it soon once I get better at it. I will be helping again this year. Wonderful! Thank you so much Mary Jo. Thanks for starting the thread. My first envelope of 50 is ready to mail and another is started. 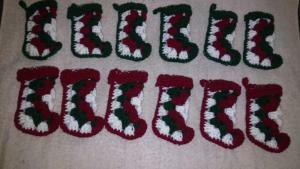 Cindy I used your mini Christmas cuffed stocking pattern for some of them. Oh so cool and already 50 done this year! Thank you so much for helping us out again this year. I better get to work! LOL. Helping again this year!! Brenda, that is awesome!!! I have posted the Waistcoat mini Christmas stocking pattern if anyone would like to crochet it. 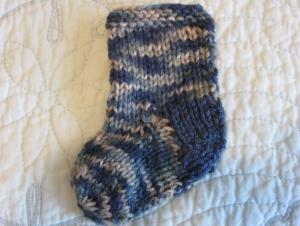 Here is the link to the free pattern. 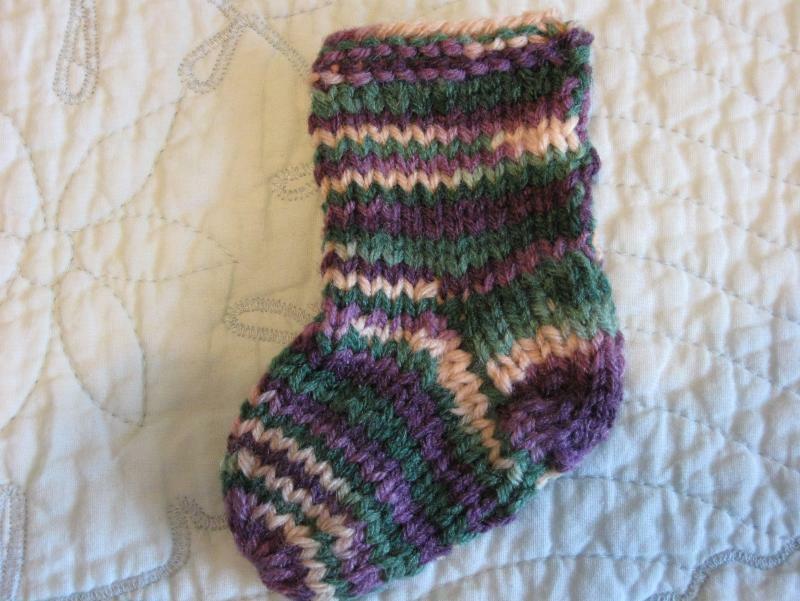 You can also just crochet the pattern in regular USA single crochet stitches. I have played around with the pattern and just worked regular SC stitches except for the stripes and graph pattern portions. Here is a photo of the two socks side by side. Left one is regular SC stitches and right hand one is all Waistcoat stitches. Regular SC ends up being a bit bigger due to the denser stitches when you crochet the Waistcoat stitch. 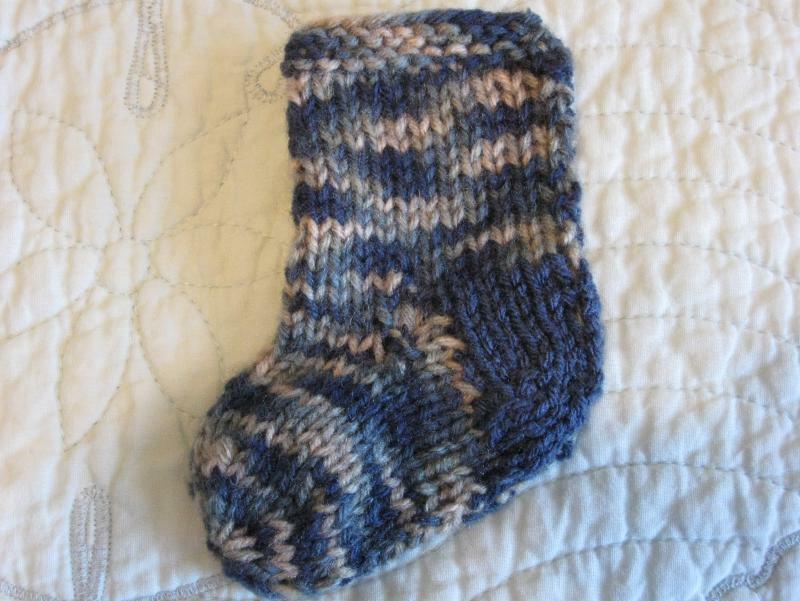 Over at Good Things Together on Ravelry, we are having a sock along for the troops for the next several weeks. 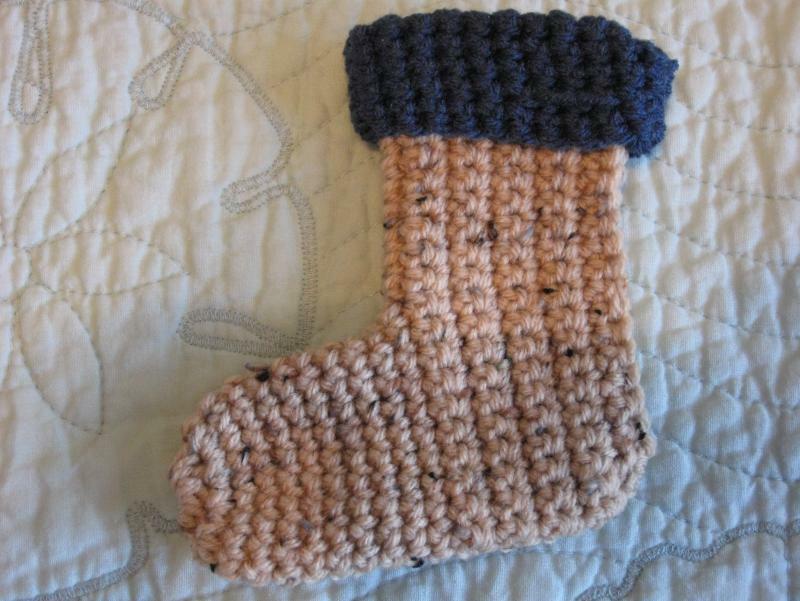 If you are making stockings and want to share them, we have 2 random prizes that will be given away for stockings made during the sock along. No need to be a member of the group. We are just promoting this year's stocking drive for Warmth for Warriors. Here is the link to read more. Thanks again to everyone helping us out this year making stockings. 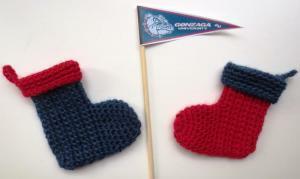 Just want to share my two Gonzaga mini Christmas stockings I crocheted in honor of the team making it to the Final Four. Go Zags! Cindy love your stockings. I have been working on some too for the sock along but havent taken pictures yet. Hope to do 5 this coming up week...! they are all so cute!!! What a great group of stockings. They are going to be so loved and appreciated by the troops. Thanks and we just love Gonzaga. I will be crocheting some additional stockings in their team colors today and tomorrow during the game. Go Zags!! This is an awesome idea, and sounds like a great way to use up balls of yarn that might not be big enough for anything big! I would like to participate this year! 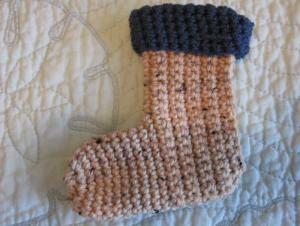 Welcome and so happy to have another crafter making stockings for the troops! Mary Jo sent me an easy pattern this morning. Made 3 today. 3 nice stockings! Great job and thanks for your help. 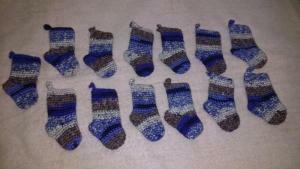 I have finished 12 stockings so far. Will try and get 2 more done tomorrow. My goal is 20 in the mail by next Saturday. 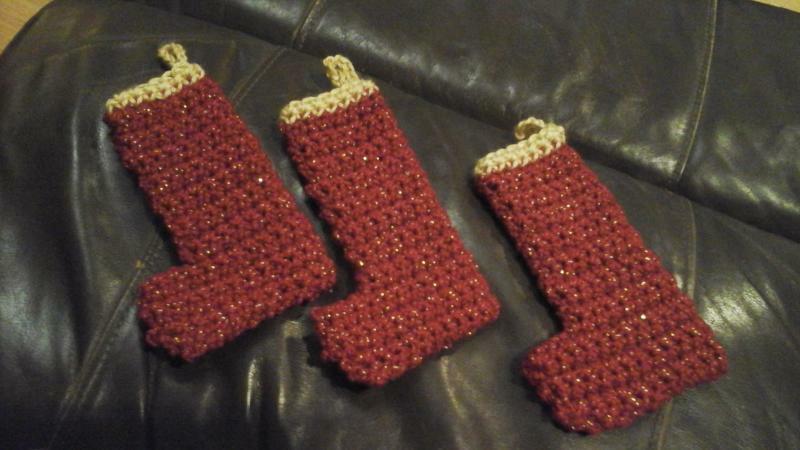 I can finally post that I have some stockings completed and can post pictures. Thank you for making so many stockings for the troops. They will be so appreciated. What wonderful group of stockings! I love the snowflake image you made on the 2nd one. Are those knitted or waistcoat stitching? 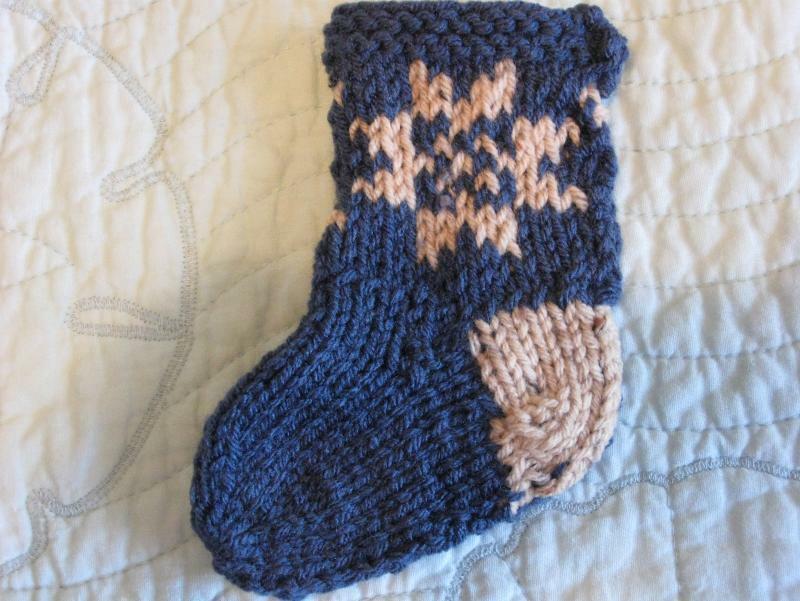 I see you did a cuffed mini stocking too. 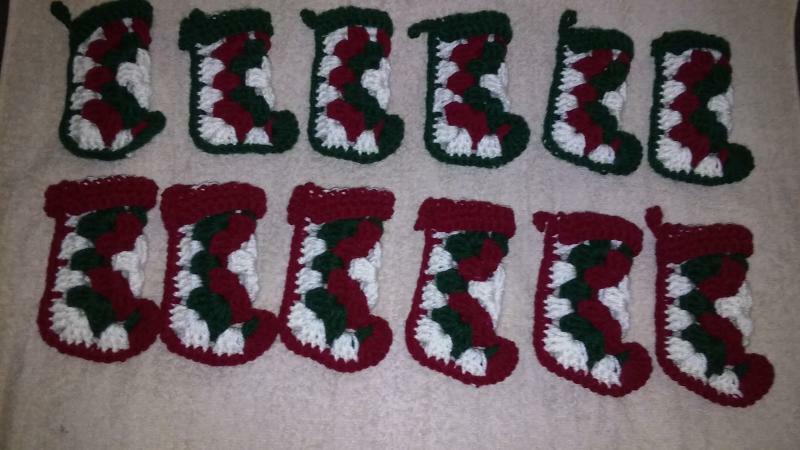 Great job and I am so excited about all the stockings that are being made already this year.